The 13 Chambers siblings (nine brothers and four sisters) grew up as part of a low-income family of sharecroppers, living in several rural areas of Mississippi throughout the 1930s and '40s and eventually settling in the northeastern part of the state near Tupelo in Lee County. Four of the brothers (George, Willie, Lester and Joe Chambers) sang in a Baptist church gospel choir during their adolsecent and teenage years. George, eldest of the four, served a tour of duty in the Army starting in 1952; two years later he and the others moved to Los Angeles to make a more concerted effort at making a living singing the Lord's praises. Little did they realize how markedly their music would evolve, taking them away from their spiritual beginning and into folk, blues, soul and psychedic rock, the latter unexpectedly leaving the most lasting impression. 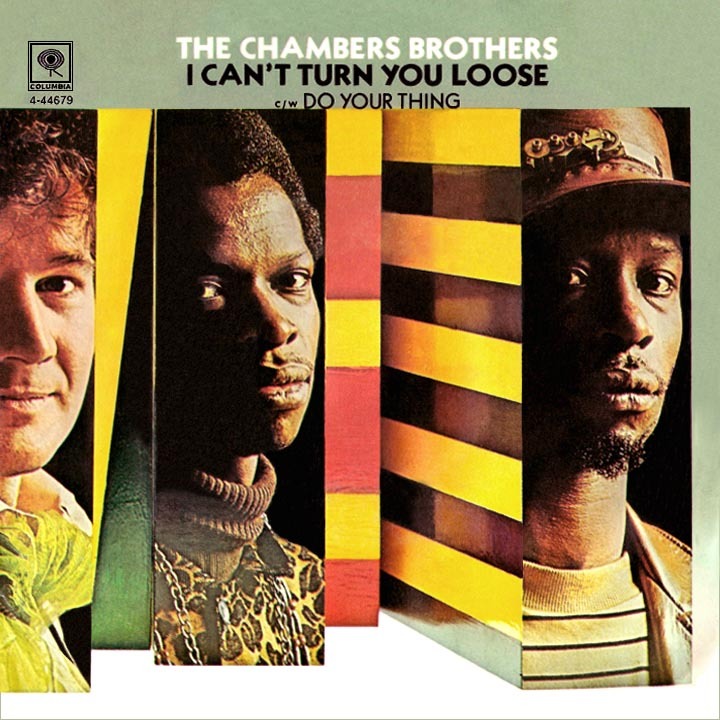 None of the four considered calling themselves anything but The Chambers Brothers and it stayed as such permanently, despite the eventual inclusion of non-family members. The vocal harmonies so important at first were gradually complemented with expert musicianship and stage presence. George played bass and lead singer Lester impressed on harmonica while Willie and Joe played guitar and gave secular songwriting a whirl. Rolling with the folk boom of the early '60s, they began playing Los Angeles area clubs. Recording for the Vault label in 1965, an opportunity to appear on the ABC-TV variety show Shindig as regular backup singers (as The Blossoms were also doing) provided steady work and a built-in opportunity to expose their music to a large nationwide audience. In fact, they made the rounds of small screen music-and-dance shows performing "Call Me," a raw and rockin' soul tune...with a prominent cowbell beat! This first single for Vault was flipped with "Seventeen," a slow-burning blues guitar track featuring Lester's lead vocal and harp work. The record didn't sell, but it was a debut disc to be proud of. 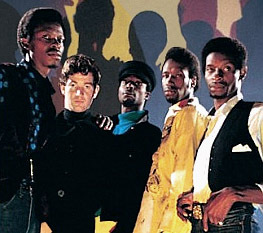 Becoming more in need of a permanent drummer, the brothers added Brian Keenan, the first group member outside their family; his nickname was "Curley," but sometimes the brothers introduced him onstage as Brian Chambers. During a stint at L.A. folk club the Ash Grove, they became acquainted with Barbara Dane (and recorded a gospel album with her the following year for Folkways Records); she introduced them to Pete Seeger, who put in a good word and got them on the roster of the Newport Folk Festival held that July (and every July since '59) in Newport, Rhode Island. Response at the event was positive, but after two albums and another single (a remake of Eugene Church's 1959 hit "Pretty Girls Everywhere"), Vault dropped the band. 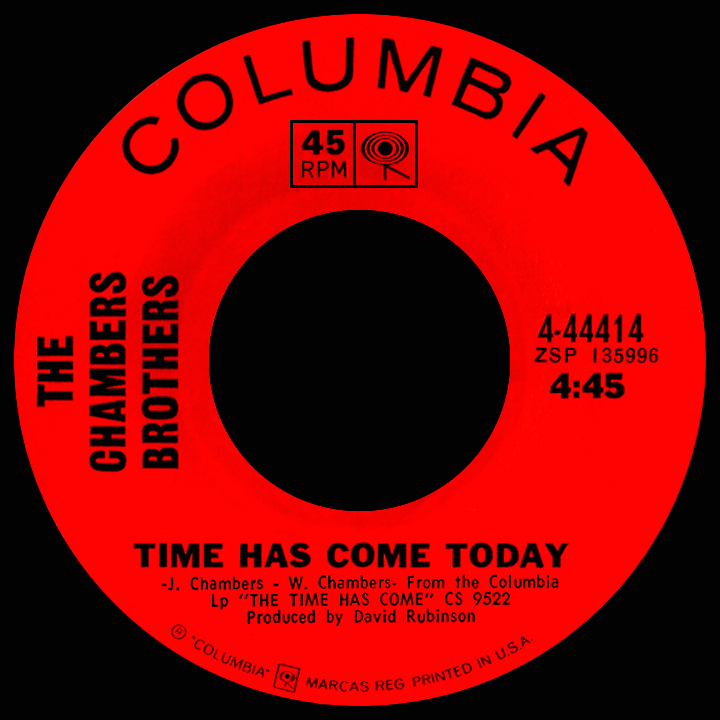 Late in 1966, the Chambers Brothers popped up on the biggest of all labels, Columbia, with a funk-rock sound far removed from previous efforts. "Time Has Come Today," a bizarre recording running two minutes and 37 seconds, was released on 45 near the end of the year. Written by brothers Joe and Willie, it was very strange: there was that cowbell again, louder than before, with a 'Cuckoo!' call followed by an echoed gargling sound...and that was just in the first ten seconds. The track had an aggressive tone, with pounding drums, throbbing bass awash in reverb and seemingly random lyrics ('...thinking about the subway...I ain't been burned up by the sun, but I've had my fun...I've been crushed by a tumbling tide...and my soul's been psychedelicized!') Radio resisted it, so a more conventional single, "All Strung Out Over You" (an uptempo soul groove), was rushed out. But Columbia hadn't yet given up on "Time." The owners of Vault, sensing something was in the air, released a compilation album in mid-'67 titled West Coast Love-In, featuring tracks by both the Chambers Brothers and The Peanut Butter Conspiracy (best known for "It's a Happening Thing"), another Vault act that had made the transition to Columbia Records. But as those major label releases fell flat, they resumed their folkish ways and made another July appearance in Newport. More comfortable performing live than in a studio, they stretched the boundaries of the festival's folk focus with a hot rendition of Wilson Pickett's "In the Midnight Hour." Time did indeed pass, as a couple more single discs flew unceremoniously by before the label took another shot at what they felt was the band's best bet. Most of the selections on the album The Time Has Come had a rhythm and blues sound, but the side-two-closing eleven minute elongation of the failed near-title-track single, featuring an instrumental fuzz guitar/drum instrumental bridge lasting about six minutes, had a strangely unique rock sound. The album's release was a bit ahead of the curve for any hopes of exposure on the progressive rock radio stations gaining favor with listeners, but somehow the buzz on the band hit the streets and the album debuted on the national album charts in February '68. Still a hard sell at top 40, the single was rereleased, its initial 2:37 edit expanded to 4:45, long by '60s standards but short enough to work in a year when radio was more open to longer rock tracks. Kudos to the patience of Columbia's promotion team; it took until the fall of '68, but "Time Has Come Today" finally became a major hit single. So unexpectedly far from where the Mississippi siblings had expected to be! The album rose along with the single into the upper regions of the charts. The follow-up 45 was a hot soul remake of Otis Redding's "I Can't Turn You Loose" that reached the top 40 just before Christmas, a bigger hit than Redding's formidable original. Vault put out an earlier live recording of "Shout!" (a live Chambers recording adding little if anything to the energy of The Isley Brothers' definitive 1959 recording). Chambers compositions "Wake Up" (in '69), "Love, Peace and Happiness" (in '70) and "Funky" (in '71) appeared briefly before the disillusioned band found themselves no longer of any use as a cog in the corporate colossus called Columbia Records. The band continued appearing in concert and later recorded for Avco Records, notching a minor soul chart hit in the spring of 1974 with Hank Ballard's "Let's Go, Let's Go, Let's Go," featuring Willie's lead vocal and gospelized harmony backing by the other brothers; anyone familiar only with "Time Has Come Today" wouldn't be capable of an accurate guess as to the artist's identity. The band split a few years later, each member following separate musical paths. The Chambers Brothers have been known to reunite from time to time, sticking mainly with what they're best at: performing for live audiences.